Background: In Indonesia, the incidence of stroke is growing rapidly every year and it becomes a burden to the government. Medications improving neurological function are required, in order to increase patient's quality of life. There were an enzyme (lumbrokinase) secreted from the alimentary tract of earthworm and it has anti-thrombotic and thrombolytic effect so that it can be beneficial in the management and prevention of stroke. DLBS1033 is a standardized bioactive protein fraction derived from Lumbricus rubellus through a patented technology of extraction. DLBS1033 has been shown to have antithrombosis and thrombolytic activities. The safety profile of DLBS1033 was also demonstrated in toxicology studies, animal studies, and in healthy adult subjects. Based on its mechanism of action and safety profile, DLBS1033 can be considered beneficial on acute ischemic stroke patients. Through this clinical study, we will evaluate the efficacy and safety of the product in acute ischemic stroke management. Methods/Design: This is a prospective, randomized, double-blind, and controlled clinical study to investigate the effects of DLBS1033 in conjunction with standard therapy compared to standard therapy alone in the management of acute ischemic stroke. Patients included into the study will be randomized into two groups and receive either standard therapy alone (as control group) or standard therapy plus DLBS1033 (as DLBS1033 group). Functional outcomes will be measured using the Modified Rankin Scale (MRS) and The Modified National Institutes of Health Stroke (mNIHSS). Discussion: The study is expected to be a medical breakthrough in acute ischemic stroke management. Therefore, the morbidity and mortality of this disease can be lowered. Trial registration: ClinicalTrials.gov identifier: NCT02362984; registered on 3 February 2015. The clinical manifestation of losing neurological function due to an acute attack is mostly associated with vascular abnormality. That vascular abnormality causing such a neurological deficiency is the so-called stroke. According to its pathology, stroke condition is divided into two groups. Ischemic stroke occurs when the blood supply to part(s) or whole part of the brain is suddenly interrupted due to the presence of blood clots, leading to lacking of nutrient and energy (like oxygen and glucose) delivered to the brain. The other type is hemorrhagic stroke, which occurs when a blood vessel in the brain bursts, spilling blood around the brain or into the space of cerebrospinal fluid (Caplan, 2009a). The incidence of ischemic stroke is higher than hemorrhagic stroke (85% versus 15%). In Indonesia, stroke is the first leading cause of death and disability condition (Hankey, 2002; the National Institute of Health Research and Development, 2008; Caplan, 2009b). In the future, the stroke incidence is even predicted to increase because of the unhealthy lifestyle. Ischemic stroke can be induced by circulation failure, general hemodinamic disturbance, increasing number of viscosity, increasing number of coagulation, blood clot formation (thrombus), emboli, and vessel damage underlying the atherosclerosis. In case of subarachnoid hemorrhage, the disturbance of energy delivery to the brain area due to vasospasm will result in an ischemic area of the brain, followed by clinical function damage. This damage is reversible when the circulation is timely repaired, otherwise it will become permanent. Some people suffer from transient ischemic attacks (TIAs), which can be called as mini-strokes that last only 5 to 20 minutes. In almost all TIAs, the symptoms disappear within an hour (Caplan, 2009a). Based on The Report of Ministry of Health (RISKESDAS 2007) and hospital data on hospitalization period of stroke patients in Indonesia, stroke becomes a serious problem not only because there is a short golden (or window) period of initiating medication, but also the complexity of handling the disease (the National Institute of Health Research and Development, 2008; Prasetyo et al., 2011). The medication target area of ischemic stroke is called penumbra. That is the area of surviving cells that does not have any function (Caplan, 2009c). In stroke, besides the cerebral blood flow reduction, an inflammation and hyperproduction of peroxides will worsen the survival of penumbra (Warlow et al., 2008). No standard therapy has currently been established for the treatment of ischemic stroke. Several therapies that have been frequently being used in the hope that they will improve the outcome after an ischemic stroke attack include thrombolytic therapy (rtPA), antiplatelet agents (aspirin, clopidogrel, cilostazol), anticoagulants (heparin, enoxaparin), as well as neuro-protective agents (citicoline, piracetam) (Adams et al., 2003). In clinical practice, there are several medications to prevent membrane cells damage induced by proteolytic enzyme or to prevent apoptosis. In case of secondary prevention, antiplatelet aggregation as a standard treatment can be used (collaboration study with aspirin). Several other studies related to medication of stroke are CAPRIE study (clopidogrel) (CAPRIE Steering Committee, 1996), CSPS study (cilostazol) (Shinohara et al., 2010), and RELY study (Dabigatran) (Ezekowitz, et al., 2009). In hyperacute condition, thrombolytic agent such as rtPA can be used. It can lyse the thrombus around the ischemic stroke area (Warlow et al., 2008; Caplan, 2009c). However, the use of thrombolytic drugs carries the real risk of major bleeding. The risks and potential benefits of rtPA should be discussed whenever possible with the patient and family before treatment is initiated. Besides, the medication with rtPA has a limitation of time. It should be used not more than 3 hours after stroke (Caplan, 2009c). Meanwhile, in Indonesia stroke patients usually come to the hospital in more than 24 hours after stroke attack. For several thousand years earthworms have widely been used in Indonesia, China, Japan, and the Far East to treat various chronic diseases. It was reported long time ago in 1899 that an enzyme secreted from the alimentary tract of the earthworm could dissolve fibrin (Willem and Minne, 1899). Mihara et al. (1991) found that the extract of earthworm from Lumbricidae family could directly dissolve fibrin and activate plasminogen. In 1991, Japanese researchers have purified and characterized group of serine protease enzyme found in Lumbricus rubellus and named collectively as lumbrokinase. Lumbrokinase has potent fibrinolytic and fibrinogenolytic activities, lowering blood viscosity, and markedly reducing platelet aggregation (Mihara et al., 1991). Lumbrokinase has been investigated in some clinical studies. A study was also done on hyperfibrinogenemia patients, and the result indicated that lumbrokinase could relieve hyperfibrinogenemia, therefore the formation of thrombin would be decreased (Gao and Qin, 1999). Studies from Jin et al. (2000, 2001) suggest that the decrease of fibrinogen content after administration of lumbrokinase is beneficial to the prevention and treatment of stroke. DLBS1033 is a standardized bioactive protein fraction derived from Lumbricus rubellus through a patented technology of extraction. DLBS1033 has been shown to have antithrombosis activities due to its fibrinogen degradation assay, antiplatelet aggregation, and ex vivo antithrombosis assay; and thrombolytic activities demonstrated by fibrin plate assay and clot lysis assay (Trisina et al., 2011). In vitro studies demonstrated reduced expression of several genes involved in inflammatory and atherogenic reaction by DLBS1033, such as nuclear factor kappa-light-chain-enhancer of activated B cells (NF-κB), tumor necrosis factor α (TNF-α), vascular cell adhesion molecule 1 (VCAM-1), and P-selectin. The down-regulation of NF-κB has a link to the inhibition of atheroma formation, suggesting that DLBS1033 can be used as an antiatherogenesis agent. DLBS1033 can inhibit the progression of other cytokines that are activated by TNF-α and adherence of leukocytes to endothelium. Activity of DLBS1033 in decreasing the expression of P-selectin may be related to the suppression of de novo synthesis of P-selectin mediated by cytokine. DLBS1033 suppressed the expression of VCAM-1, a member of the immunoglobulin gene superfamily that mediates leukocyte binding to the endothelial cell (Kurnia and Tjandrawinata, 2011). In the same study, it was shown that DLBS1033 suppressed the expression of MMP-9 gene, a marker of plaque instability, suggesting that this bioactive protein fraction has the ability to control plaque stabilization. MMP-9 is a protease that degrades extracellular matrix proteins including gelatin, collagen, elastin, and laminin that are important in tissue destruction; and also in tissue remodeling and inflammation. This study indicated that DLBS1033 could regulate the uncontrolled event of plaque rupture by inhibiting the expression of MMP-9. Besides, DLBS1033 also down-regulated JAK/STAT1 system which is responsible for vascular smooth muscle cell proliferation (Kurnia and Tjandrawinata, 2011). The toxicology studies, in vitro in cell cultures (Sunardi, et al., 2008), preclinical acute toxicology (Sukandar, et al., 2009), subchronic toxicology (Sajuthi and Suhartono, 2008), and teratogenic toxicology (Sukandar, 2009) studies in rats also have confirmed the safety profile of DLBS1033. The safety profile of DLBS1033 was also demonstrated in an animal study using healthy Macaca fascicularis (Sajuthi, et al., 2008), in which DLBS1033 did not affect the number of thrombocytes, blood glucose level, triglyceride level, and body weight. In a different study which was also conducted in rats, addition of DLBS1033 treatment to aspirin or clopidogrel (dual antiplatelet agents) for 28 days did not increase the risk of bleeding. However, concomitant use of triple agents (DLBS, aspirin, and clopidogrel) led to a linear progression of petechiae in the gastric mucosa (Sukandar et al., 2014). Safety profile of DLBS1033 has also been demonstrated in healthy adult subjects (Gayatri, 2012; Yunaidi, et al., 2011). Based on the evaluation of safety parameters, which included hematology parameters, blood chemistry, urine and stool occult blood evaluation, and ECG interpretation, DLBS1033 was proven safe in healthy subjects. To date, DLBS1033 has been approved by National Agency of Drug and Food Control (NADFC), Republic of Indonesia, to be marketed as Indonesian traditional medicine (with brand name of Degrade®, POM TR 111 527 331). Since then, no clinically significant adverse drug reactions have been reported. Based on its mechanism of action and safety profile, DLBS1033 benefits acute ischemic stroke patients. Therefore, through the current clinical study, we will evaluate the efficacy and safety of the product in acute ischemic stroke. In this study we use standard therapy recommended by American Heart Association/American Stroke Association Guidelines for acute ischemic stroke (Adams et al., 2007). The standard therapy used in this study includes aspirin, statin, and vitamin B complex. To investigate the efficacy of bioactive protein fraction DLBS1033 combined with standard therapy compared to standard therapy alone in improving functional outcomes in acute ischemic stroke patients, as measured by Modified Rankin Scale (MRS) and The Modified National Institutes of Health Stroke Scale (NIHSS). To investigate the efficacy of bioactive protein fraction DLBS1033 combined with standard therapy compared to standard therapy alone in improving hemostatic parameters in acute ischemic stroke patients, as measured by fibrinogen and D-dimer level. To evaluate the safety of bioactive protein fraction DLBS1033 combined with standard therapy in acute ischemic stroke patients. Treatment with DLBS1033 at the dose of 3 × 490 mg daily in addition to the standard therapy of acute ischemic stroke is more effective than the standard therapy alone in improving neurologic function measured by Modified Rankin Scale (MRS) and The Modified National Institutes of Health Stroke Scale (NIHSS). Treatment with DLBS1033 at the dose of 3 × 490 mg daily in addition to the standard therapy of acute ischemic stroke is more effective than the standard therapy alone in improving hemostatic parameters measured by fibrinogen and D-dimer level. Treatment with DLBS1033 at the dose of 3 × 490 mg daily in addition to the standard therapy is considered safe in the management of ischemic stroke patients. This is a prospective, randomized, double blind, and controlled clinical study to investigate the effects of DLBS1033 in conjunction with standard therapy compared to standard therapy alone. Patients included into the study will be randomized into two groups and receive either standard therapy alone (as control group) or standard therapy plus DLBS1033 (as DLBS1033 group) administered orally for 8 days. This research will be held in neurological ward (Melati ward) in RSUD R. Syamsudin, SH hospital, Indonesia. It will begin in October 2014 and expected to be completed in June 2015. Laboratory and serum biochemistry will be processed in Laboratory Unit in RSUD R. Syamsudin, SH and Praditha Laboratory in Sukabumi. Study population is acute ischemic stroke patients with Partial Anterior Circulation Infarct (PACI) and Lacunar Anterior Circulation Infarct (LACI) as classified by Bamford criteria according to the symptoms and signs with which region of the brain has been affected. There will be 116 subjects (58 subjects in each group) planned to be enrolled in the study. History of serious head injury within the last 3 months. Current or regular use of oral anticoagulants, antiplatelets other than study medication, and herbal medicines. Improvement rate on days 4 and 8 (end of study) as defined by proportion of subjects with category of Modified Rankin Scale (MRS) of 0-2. 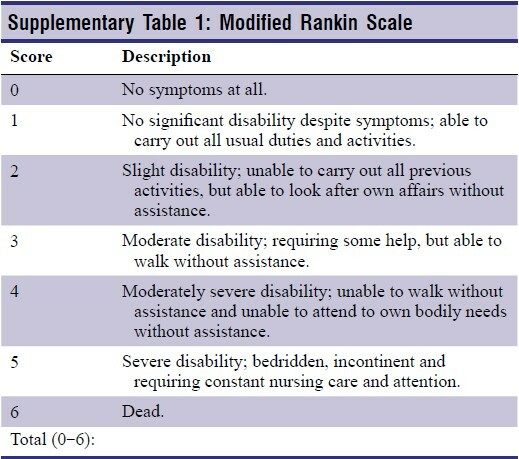 The 6-point Modified Rankin Scale (MRS) assesses the extent of disability after stroke attack (supplementary Table 1 online). Patients with no impairment or symptoms receive the best score of 0; while patients with severe disability, who are bedridden, incontinent, and require constant nursing care and attention are rated the worst score of 5; death is scored 6 in MRS (Bonita and Beaglehole, 1998). Modified Rankin Scale (MRS) has moderate to excellent inter-rater reliability (Van Swieten et al., 1988). The scale has also been shown to be valid and is considered more powerful than the Barthel Index as a primary endpoint in a clinical trial of stroke therapy (Wilson et al., 2002; Weir, et al., 2004; Young et al., 2005; Jensen and Lyden, 2006). Improvement (change) in functional outcomes from baseline to days 4 and 8 of treatment as measured by the modified National Institute of Health Stroke Scale (mNIHSS). The National Institute of Health Stroke Scale (NIHSS), a standardized measure of neurological function, has been used in clinical trials to assess neurological outcome after investigational therapy for acute stroke (Wityk et al., 1994). NIHSS is used to study the degree and time course of recovery in patients with acute stroke who were treated with conventional therapy. The NIHSS is a convenient, rapidly applied scale for neurological assessment that correlates with other measures of stroke outcome, such as infarct size on clinical trial. It takes only less than 10 minutes to complete NIHSS. Because of its simplicity and higher inter-rater reliability, it is well suited for clinical treatment trials of acute stroke, in which serial assessments may be performed by different persons (Brott et al., 1989a, b; Goldstein et al., 1989). 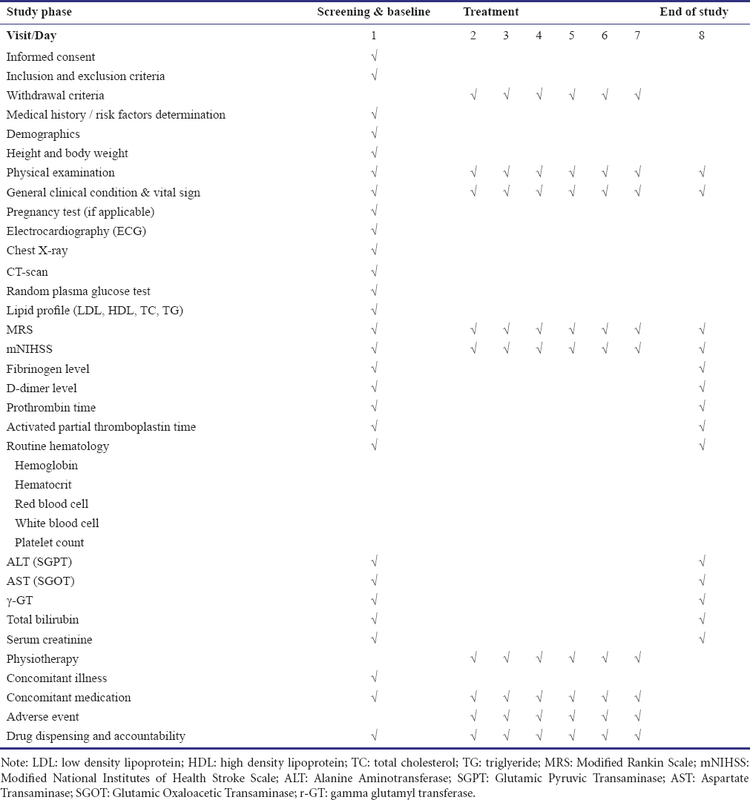 The NIHSS is an 11-item assessment of neurological function modified from Brott et al. (1989a) (supplementary Table 2 online). Several simpler versions have been proposed, but the most validated is the Modified or mNIHSS (Meyer et al., 2002; Lyden et al., 2006). Previous studies used an increase or decrease in the stroke score by 4 points or more in NIHSS as a marker for clinically important change (Brott et al., 1992). While in mNIHSS early changes (i.e. improvement by 2 points or more) in the total score were also strongly predictive of a favorable outcome following treatment with thrombolytic agents (Meyer et al., 2002; Hacke et al., 2004). Baseline severity as measured by the NIHSS is the most important predictor of ultimate outcome (Schlegel et al., 2003, 2004; Derex et al., 2004). The dynamic observation of plasma fibrinogen and D-dimer of acute ischemic stroke may has an early prognostic value on progressive ischemic stroke. There is a more significant hypercoagulabale state in progressive ischemic stroke. Safety parameters other than vital signs and adverse event will be measured at baseline and end of study. Vital signs and adverse event will be measured at baseline and every follow-up visit including end of study. Adverse events: (1) Bleeding events / tendency, such as hematuria, gastric bleeding, decrease of hemoglobin level of > 2 g/dL or any major bleeding events necessitating hospitalization. Tendency of bleeding will therefore be carefully evaluated through routine hematology. (2) Other adverse events. Any adverse event will be observed and carefully evaluated along the course of the study. Patients hospitalized in neurological ward (Melati ward) R. Syamsudin, SH hospital and diagnosed with acute ischemic stroke (confirmed by CT Scan) will be screened based on inclusion criteria. If patients were eligible to be enrolled in this study, patients would be handled as per acute ischemic stroke management and the treatment(s) will be switched immediately into the study's regimens. Patients included into the study will be randomized into two groups and receive either standard therapy alone (as control group) or standard therapy plus DLBS1033 (as DLBS1033 group). Randomization and blinding code preparation will be performed by Ferron Par Pharmaceuticals (FPP) using the permuted block-allocation and Table of Random numbers. The blinding codes will be prepared by the Management of FPP who is not directly involved in both the study preparation and conduct, so as that even the Monitor(s) and Data Management will also be blind of the codes till the unblinding procedures apply. All packaging and labeling of the study products will be prepared by FPP according to the current Good Manufacturing Practice (cGMP). The study products will be prepared in such packages which will be recognized as products for clinical trial only. In order to keep the blinding procedures, the study drugs will all be provided by FPP in a double-blind double-dummy preparation. Dummy tablets (as placebo of DLBS1033) will also be prepared by FPP and made identical in appearance with the active tablets. Each subject will receive two kinds of medication, i.e. either DLBS1033 tablets or its dummy and standard therapies, in sufficient numbers to be taken over 8 days of study period. By that way, each subject in both groups will receive apparently identical study medication, disabling them as well as the Investigator to identify which of the study treatments received by each individual subject. Bioactive protein fraction DLBS1033 enteric coated tablet @ 490 mg.
Investigational drug will be administered orally, one tablet three times daily for 8 days of study period. Placebo will be administered orally, one tablet three times daily for 8 days of study period. Simvastatin film-coated tablet @ 20 mg (Esvat®, PT Dexa Medica), will be given orally, one tablet once daily for 8 days of study period. Vitamin B complex film-coated tablet (Neurodex®, PT Dexa Medica), consisted of vitamin B 1 mononitrate 100 mg, vitamin B 6 HCl 200 mg, and vitamin B 12 200 mcg, will be given orally, one tablet once daily for 8 days of study period. Citicoline injection in ampule @ 250 mg/2 mL (Neulin®, PT Ferron Par Pharmaceuticals), will be given as IV drip, 250 mg twice daily for 8 days of study period. Subjects, whose blood pressures have been well-controlled (less than 140/90 mmHg or 130/80 mmHg in diabetics) with currently used agents, can continue their therapy. Otherwise, they will receive ramipril, amlodipine, bisoprolol, and/or HCT tablets, as ACE inhibitor, calcium channel blocker, β-blocker, and diuretic, respectively. Subjects with diabetes should continue their diabetes therapy. Those with newly-diagnosed diabetes mellitus should also be treated in accordance with the proper diabetes management. Subjects with random plasma glucose more than 200 mg/dL at screening will be excluded from the study. Otherwise, they should be given a short-acting insulin therapy until the plasma glucose is controlled prior to enrollment (72 hours after the onset of stroke). After insulin therapy, if random blood sugar < 200 mg/dL, then subjects will be included in this study. There will be 2 groups of treatment; each will consist of 58 subjects. A total of 116 subjects will be randomized into two groups ([Table 1]). All subjects will be instructed to have the examination for efficacy and safety evaluation 3 and 7 days after medication initiation. Physiotherapy will be given to each study subject every day during hospitalization. All subjects will be under direct supervision of a medical doctor during the study period. Further details of visit schedule are shown in [Table 2]. Before its commencement, the study protocol must obtain approval from the Independent Ethics Committee situated in the country where the clinical study will be conducted. Informed consent will be obtained from each clinical trial subject or his/her legal guardian. After hospital admission and diagnosis, patient will be handled as per acute ischemic stroke management in study site. Right after the patient is confirmed eligible to the study, the treatment(s) will be switched immediately into the study treatments. Clinical and laboratory examinations to evaluate the investigational drug's efficacy will be performed at baseline and days 4 and 8 of treatment (end of study); while safety examinations will be performed at baseline and end of study. Eligible subjects will be closely monitored by an investigator during their participation in the study to evaluate the outcome. The schematic design of the study is shown in [Figure 1]. Figure 1: Study design of DLBS1033. Note: MRS: Modified Rankin Scale; mNIHSS: Modified National Institutes of Health Stroke Scale; TIA: transient ischemic attack; MI: myocardial infarction; CHF: congestive heart failure; AF: atrial fibrillation; ALT: Alanine Aminotransferase; AST: Aspartate Transaminase; GGT: gamma glutamyl transferase; SIRS: systemic inflammatory response syndrome; SBP: systolic blood pressure; DBP: diastolic blood pressure. PT: prothrombin time; aPTT: activated partial thromboplastin time. Chest X-ray examination will be done in anterior posterior position. Radiography evaluation consists on physiology and pathology description of heart and lungs. Chest X-ray examination will be performed using Siemens ® Digital X-Ray (last calibrated in 2014). Evaluation will be done by radiologists and neurologists. Head CT scan examination will be done toward patients with suspect acute ischemic stroke. The goal from this examination is to diagnose ischemic stroke correctly. CT scan will be performed using Philips ® (last calibrated in 2014). Evaluation will be done by radiologists and neurologists. Electrocardiography examination will be done using Fukuda ® (last calibrated in 2014). Evaluation will be done by neurologist. Pregnancy test Pregnancy test will be performed using Focus Diagnostics ® HCG rapid test strip method. Morning urine will be used as sample. Positive indicators marked by two red lines (=). Complete blood count Complete blood count consists of hemoglobin, hematocrit, leukocytes, and platelets. Complete blood count will be performed using Mindray ® by independent method. Dilven ST and Lyse BC3 will be used as reagen. Instrument was last calibrated in 2014. Random blood glucose will be performed using ABX Pentra by enzymatic (hexokinase) method. The ABX Pentra Glucose HK CP will be used as reagen. Catalog number is A11A01667. Normal range is 74-10 6 mg/dL. Instrument was last calibrated in 2014. LDL examination will be performed using ABX Pentra by LDL direct CP method. The ABX Pentra LDL direct CP will be used as reagen. Catalog number is A11A01638. Normal value is < 150 mg/dL. Instrument was last calibrated in 2014. Serum Glutamic Oxaloacetic Transaminase (SGOT) will be performed using ABX Pentra by IFCC (modified method without pyridoxal phosphate). The ABX Pentra ALT CP will be used as reagen. Catalog number is A11A01627. Normal value for male is < 34 U/L; for female is < 31 U/L. Instrument was last calibrated in 2014. Serum Glutamic Pyruvic Transaminase (SGPT) or Alanine Aminotransferase (ALT) Serum Glutamic Pyruvic Transaminase (SGPT) will be performed using ABX Pentra by kynetic photometric method. The ABX Pentra ALP CP will be used as reagen. Catalog number is A11A01639. Normal value for male is < 46 U/L; for female is < 36 U/L. Instrument was last calibrated in 2014. Serum creatinine will be performed using ABX Pentra by Jaffe developed method. The ABX Pentra Creatinine 120 CP will be used as reagen. Catalog number is A11A01933. Normal value for male is < 1.1 mg/dL; for female is < 0.9 mg/dL. Instrument was last calibrated in 2014. Total bilirubin will be performed using ABX Pentra by photometric test using 2,4-dichloroaniline method. The ABX Pentra Bilirubin Total CP will be used as reagen. Catalog number is A11A01639. Normal range is 6.7-8.7 mg/dL. Instrument was last calibrated in 2014. D-dimer level will be performed by immunology mechanic method. Fibrinogen level will be performed by coagulation mechanic (Clauss) method. Prothrombin level will be performed by coagulation mechanic method. Activated Partial Thromboplastin Time level will be performed by coagulation mechanic method. Subjects will receive standard therapy recommended by American Heart Association/American Stroke Association Guidelines. In addition to standard therapy, patients will receive either DLBS1033 or placebo. A sheet of paper will be given to each subject so that any adverse events that occur in every subject can be recorded. There are many things to record, such as frequency, severity, relationships with drug research, and others. Bleeding events/tendency, such as hematuria, gastric bleeding, decrease of hemoglobin level of > 2 g/dL, or any major bleeding events necessitating hospitalization should be recorded. Tendency of bleeding will therefore be carefully evaluated through routine hematology measured on Day 1 (baseline) and 8th. If massive bleeding occurs, it will be recorded, and subject will be excluded from this study. Subjects will be consulted to related specialist and will be treated based on clinical pathway. Sample size estimation was based on the primary efficacy endpoints: the improvement rate in terms of MRS category of 0-2 at the end of study. The primary hypothesis of interest of this study is that treatment with DLBS1033 in addition to the standard therapy of acute ischemic stroke is more effective than the standard therapy alone in improving motoric function measured by Modified Rankin Scale (MRS). The improvement rate of 75% in terms of MRS category 0-2 have been reported in a study using low-dose aspirin treatment (for 3 months) in subjects with ischemic stroke (Fujita et al., 2011). Using Formula 1, a significance level 0.05, and a statistical power of at least 80% to detect the minimum clinically significant difference of improvement rate between groups of 20%, 58 patients per arm are required to complete the trial. Thus, a total of 116 patients (58 patients per arm) will be enrolled to accommodate a drop-out rate of about 15%. Demography and baseline characteristics of the study population will be tabulated and summarized by descriptive statistics. Characteristic comparability between groups at baseline will be assessed by independent t-test, for continuous data; or by chi-square test, for categorical data. Primary efficacy endpoints will be analyzed between groups by chi-square test. Secondary efficacy endpoints will be analyzed between groups by independent t-test, while within group by repeated measures (related ANOVA). Safety assessment will be based on laboratory examination (haematological examination, liver function, and renal function) and adverse events. All laboratory examinations, such as hemoglobin, hematocrit, RBC, WBC, platelet count, AST, ALT, γ-GT, total bilirubin, and serum creatinine, as well as vital signs at each visit will be descriptively summarized in the tables of means. Those parameters will be statistically analysed within group to compare the values between baseline and end of study by paired t-test. Throughout the analysis, variables may be log-transformed in order to meet the underlying distributional assumptions of the statistical models; or the corresponding nonparametric test will be used. All statistical tests will be at 5% significance level. Adverse events will be summarized by system organ class and WHO ARD preferred term. The summary on number of subjects with event, percentage of exposed with event, and number of events will be tabulated. In conducting this study, the researcher will ask an ethic recommendation from Faculty of Medicine, University of Indonesia and hospital's director as an approval for conducting the biomedical research on human as a study subject. In this study, all procedures will be done based on the subject approcal through written informed consent. This study was performed to evaluate the efficacy and safety of DLBS1033 in acute ischemic stroke management. The outcomes of this study are expected to be a breakthrough in medical science. In Indonesia, stroke is one of the most common vascular diseases. This condition happens due to lack of public awareness about the importance of health. Since the preventive effort is still minimal, stroke management is now leaning towards curative instead of preventive effort. Many previous studies proved that treatment with DLBS1033 in addition to the standard therapy is effective in improving motoric function of acute ischemic stroke patients. Through this study, DLBS1033 is expected to lower the level of morbidity and mortality in acute ischemic stroke cases. Thus, people with acute ischemic stroke will have a better quality of life. Supplementary Table 2 [Additional file 2] : The Modified National Institutes of Health Stroke Scale (mNIHSS). MS designed the trial protocol, B, ZW, and EA collected and analyzed statistical data. MS served as a principle investigator and wrote the paper. NM, RRT, PH, NH, LWS, F and DP participated in trial design and conduction. All authors approved the final version of the paper. Adams HP Jr, del Zoppo G, Alberts MJ, Bhatt DL, Brass L, Furlan A, Grubb RL, Higashida RT, Jauch EC, Kidwell C, Lyden PD, Morgenstern LB, Qureshi AI, Rosenwasser RH, Scott PA, Wijdicks EF; American Heart Association; American Stroke Association Stroke Council; Clinical Cardiology Council; Cardiovascular Radiology and Intervention Council (2007) Guidelines for the early management of adults with ischemic stroke: a guideline from the American Heart Association/American Stroke Association Stroke Council, Clinical Cardiology Council, Cardiovascular Radiology and Intervention Council, and the Atherosclerotic Peripheral Vascular Disease and Quality of Care Outcomes in Research Interdisciplinary Working Groups: the American Academy of Neurology affirms the value of this guideline as an educational tool for neurologists. Stroke 38:1655-1711. 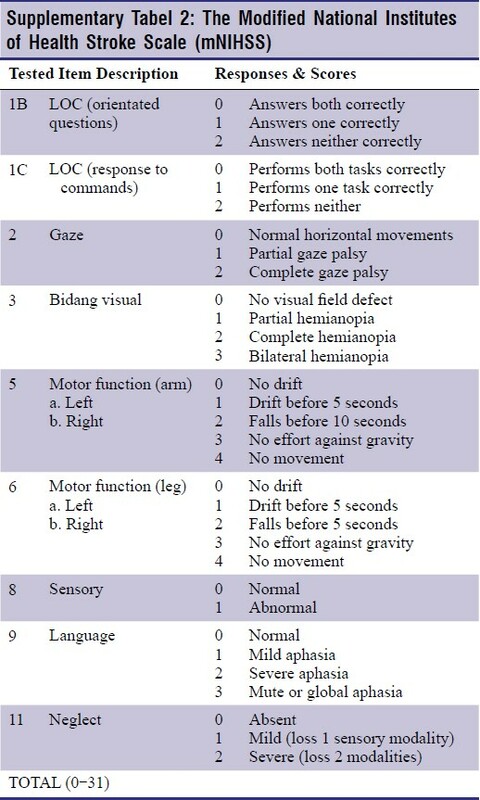 Bonita R, Beaglehole R (1988) Modification of Rankin Scale: Recovery of motor function after stroke. Stroke 19:1497-1500. Brott T, Adams HP, Olinger CP, Marler JR, Barsan WG, Biller J, Spilker J, Holleran R, Eberle R, Hertzberg V, Rorick M, Moomaw CJ, Walker M (1989a) Measurements of acute cerebral infarction: a clinical examination scale. Stroke 20:864-870. Brott T, Marler JR, Olinger CP, Adams HP, Tomsick T, Barsan WG, Biller J, Eberle R, Hertzberg V, Walker M (1989b) Measurements of acute cerebral infarction: lesion size by computed tomography. Stroke 20:871-875. Brott TG, Haley EC, Levy DE, Barsan W, Broderick J, Sheppard GL, Spilker J, Kongable JL, Massey S, Reed R, Marler JR (1992) Urgent therapy for stroke, part I: pilot study of tissue plasminogen activator administered within 90 minutes. Stroke 23:632-640. Caplan LR (2009a) Basic pathology, anatomy and pathophysiology of stroke. In: Caplan's stroke: A clinical approach (4 th ed), pp22. Philadelphia: Saunders Elsevier. Caplan LR (2009b) Diagnosis and the clinical encaunter. In Caplan's stroke: A clinical approach (4 th ed), pp67.Philadelphia: Saunders Elsevier. Caplan LR (2009c) Treatment. Basic pathology, treatment. In Caplan's stroke: A clinical approach (4 th ed). pp148. Philadelphia: Saunders Elsevier. CAPRIE Steering Committee (1996) A randomised, blinded, trial of clopidogrel versus aspirin in patients at risk of ischaemic events (CAPRIE). Lancet 348:1329-1339. Derex L, Nighoghossian N, Hermier M, Adeleine P, Berthezène Y, Philippeau F, Honnorat J, Froment JC, Trouillas P (2004) Influence of pretreatment MRI parameters on clinical outcome, recanalization and infarct size in 49 stroke patients treated by intravenous tissue plasminogen activator. J Neurol Sci 225:3-9. Ezekowitz MD, Connolly S, Parekh A, Reilly PA, Varrone J, Wang S, Oldgren J, Themeles E, Wallentin L, Yusuf S (2009) Rationale and design of RE-LY: Randomized evaluation of long-term anticoagulant therapy, warfarin, compared with dabigatran. Am Heart J 157:805-810. Fujita K, Komatsu Y, Sato N, Higuchi O, Kujiraoka Y, Kamezaki T, Suzuki K, Matsumura A (2011) Pilot study of the safety of starting administration of low-dose aspirin and cilostazol in acute ischemic stroke. Neurol Med Chir (Tokyo) 51:819-824. Gao Y, Qin MZ (1999) Lumbrokinase in treatment of patients with hyperfibrinogenemia of coronary atherogenesis disease. Shoudu Yike Daxue Xuebao 4:264-269. Gayatri A (2012) The effect of DLBS1033 on fibrinolytic parameters in healthy volunteers. Jakarta: University of Indonesia. Goldstein LB, Bertels C, Davis JN (1989) Inter-rater reliability of the NIH stroke scale. Arch Neurol 46:660-662. Hacke W, Donnan G, Fieschi C, Kaste M, von Kummer R, Broderick JP, Brott T, Frankel M, Grotta JC, Haley EC Jr, Kwiatkowski T, Levine SR, Lewandowski C, Lu M, Lyden P, Marler JR, Patel S, Tilley BC, Albers G, Bluhmki E (2004) Association of outcome with early stroke treatment: Pooled analysis of ATLANTIS, ECASS, and NINDS rt-pa stroke trials. Lancet 363:768-774. Hankey GJ (2002) Aetiological diagnosis 1 in stroke: Your questions answered. pp: 93. United Kingdom: Churchill Livingstone. Jauch EC, Saver JL, Adams HP Jr, Bruno A, Connors JJ, Demaerschalk BM, Khatri P, McMullan PW Jr, Qureshi AI, Rosenfield K, Scott PA, Summers DR, Wang DZ, Wintermark M, Yonas H; American Heart Association Stroke Council; Council on Cardiovascular Nursing; Council on Peripheral Vascular Disease; Council on Clinical Cardiology (2003) Guidelines for the early management of patients with ischemic stroke. Stroke 34:1056-1083. Jensen MB, Lyden P (2006) Stroke scales: An update. Stroke Clinic Updates 16:1-7. Jin L, Jin H, Zhang G, Xu G (2000) Changes in coagulation and tissue plasminogen activator after treatment of cerebral infarction with lumbrokinase. Clin Haemorrh Microcirc23:213-218. Jin LR, Wang X, Fan W, Zhang GP, Jin HM (2001) A prospective random double-blinded study on the changes of coagulation-fibrinolysis system in post-stroke patients receiving treatment of lumbrokinase. J Chin Microcirc 5178-182. Kurnia F, Tjandrawinata RR (2011) Bioactive protein fraction DLBS1033 exerts its positive pleiotropic effects in the vascular cells via down regulation of gene expression. Medicinus 24:18-24. Lyden PD, Lu M, Levine S, BrottTG, Broderick J; NINDS rtPA Stroke Study Group (2001) A modified National Institutes of Health stroke scale for use in stroke clinical trials. Preliminary reliability and validity. Stroke 32:1310-1317. Meyer BC, HemmenTM, Jackson C, Lyden PD (2002) Modified National Institutes of Health stroke scale for use in stroke clinical trials. Stroke 33:1261-1266. Mihara H, Sumi H, Yoneta T, Mizumoto H, Ikeda R, Seiki M, Maruyama M (1991) A novel fibrinolytic enzyme extracted from the earthworm, Lumbricus rubellus. Jpn J Physiol 41:461-472. Prasetyo E, Harris S, Sitorus F, Herqutanto (2011) Waktu kedatangan stroke di lima rumah sakit pemerintah di DKI Jakarta dan faktor-faktor yang mempengaruhinya. Jakarta: University of Indonesia..
Sajuthi D, Suhartono MT (2008). Subchronic toxicity study of DLBS1033 extract in rat. Jakarta: University of Atmajaya. Sajuthi D, Suhartono MT, Tjandrawinata RR (2008) Thrombolytic effect and safety study of standardized DLBS1033 protein extract given to Macaca fascicularis. Cikarang: DLBS. Schlegel D, Kolb SJ, Luciano JM, Tovar JM, Cucchiara BL, Liebeskind DS, Kasner SE (2003) Utility of the NIH stroke scale as a predictor of hospital disposition. Stroke 34:134-137. Schlegel DJ, Tanne D, Demchuk AM, Levine SR, Kasner SE; Multicenter rt-PA Stroke Survey Group (2004) Prediction of hospital disposition after thrombolysis for acute ischemic stroke using the National Institutes of Health stroke scale. Arch Neurol 61:1061-1064. Shinohara Y, Katayama Y, Uchiyama S, Yamaguchi T, Handa S, Matsuoka K, Ohashi Y, Tanahashi N, Yamamoto H, Genka C, Kitagawa Y, Kusuoka H, Nishimaru K, Tsushima M, Koretsune Y, Sawada T, Hamada C; CSPS 2 group (2010) Cilostazol for prevention of secondary stroke (CSPS 2): An aspirin-controlled, double-blind, randomised non-inferiority trial. Lancet Neurol 9:959-968. Sukandar EY (2009) Teratogenic study of DLBS1033. Bandung: LAPI. Sukandar EY, Sigit JI, Adnyana IK (2009) Acute toxicity of DLBS1033. Bandung: ITB. Sukandar EY, Anggadireja K, Sigit JI, Adnyana K, Tjandrawinata RR (2014) Toxicity studies of a bioactive protein with antithrombotic thrombolytic activity, DLBS1033. Drug Chem Toxicol 37:8-16. Sunardi F, Trisina J, Tjandrawinata RR (2008) Toxicity study of standardized DLBS1033 protein extract in fibroblast 3T3 and macrophage RAW264.7 cell culture. Cikarang: DLBS. The National Institute of Health Research and Development (2008) Report on result of national basic health result (RISKESDAS) 2007. Ministry of Health, Republic of Indonesia. Trisina J, Sunardi F, Suhartono MT, Tjandrawinata RR (2011) DLBS1033, a protein extract from Lumbricus rubellus, possesses antithrombotic and thrombolytic activities. J Biomed Biotechnol doi:10.1155/2011/519652. Van Swieten JC, Koudstaal PJ, Visser MC, Schouten HJ, van Gijn J (1988) Interobserver agreement for the assessment of handicap in stroke patients. Stroke 19:604-607. 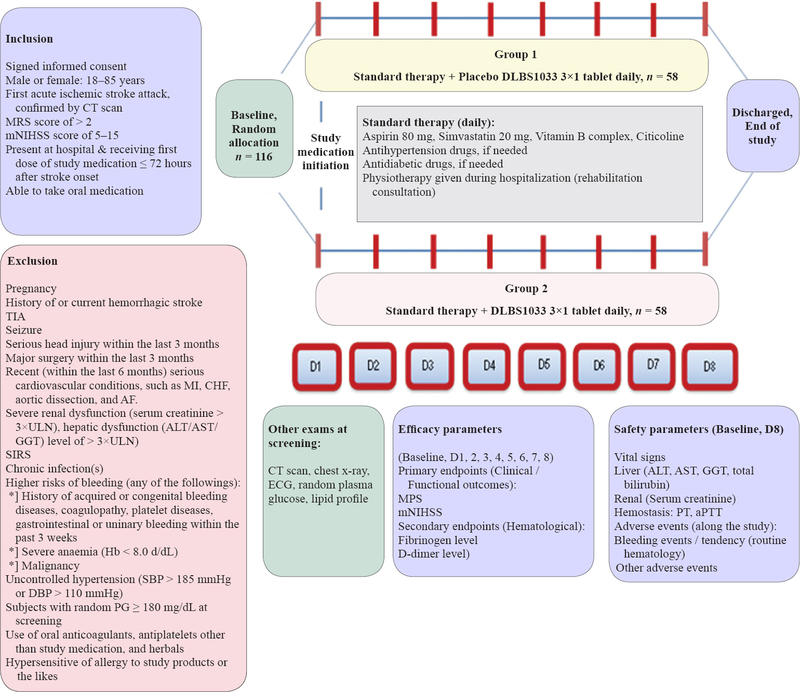 Warlow CP, van Gijn J, Dennis MS, Wardlaw JM, Bamford JM, Hankey GJ, Sandercock PA, Rinkel G, Langhorne P, Sudlow C, Rothwell P (2008) Specific treatments for acute ischemic stroke. In Stroke practical management (3rd ed). pp649-450. Massachussetts: Blackwell Publishing. Weir CJ, Kaste M, Lees KR (2004) Targeting neuroprotection clinical trials to ischemic stroke patients with potential to benefit from therapy. Stroke 35:2111-2116. Willem V, Minne A (1899) Recherches sur l'excretion chez quelques annelides, Mem.couronnes et Mem.des savants etrangers. Acad. R. de Belgique, Classe des Sciences. lviii, 72: Pls. i-iv. Wilson JT, Hareendran A, Grant M, Baird T, Schulz UG, Muir KW, Bone I (2002) Improving the assesssment of outcomes in strokes. Stroke 33:2243-2246. Wityk RJ, Pessin MS, Kaplan RF, Caplan LR (1994) Serial assessment of acute stroke using the NIH stroke scale. Stroke 25:362-365. Young B, Lees KR, Weir CJ (2005) Improving trial power through use of prognosis-adjusted end points. Stroke 36:597-601. Yunaidi DA, Putri RSI, Astoro NW (2011) A randomized, double-blind, placebo-controlled, cross- over, and fixed-dose study to evaluate the safety and efficacy of DLBS1033 in healthy subjects. Jakarta: PT Equilab International.